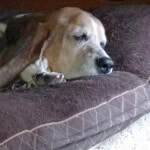 Flash crossed the Rainbow Bridge on Saturday June 11th. He was 12.5 years old. He is now with Sherlock and able to run and play. We adopted Flash at 1.5 years old. He gave us many years of happiness. He was loved and spoiled by many. I am happy knowing that I gave him a great life. He always knew he was loved and cared for. 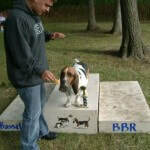 Flash won “Best Tail Wagging” at the 2009 Bassetfest. Flash was always good for shenanigans! At one Bassetfest, he broke into a cooler and took a bag of hotdogs for the hot dog game. I brought him back to confess and apologize. Needless to say, during the apology part, he lifted his leg on your scoreboard. Embarrassing at the time, but I’d note one of my favorite memories. 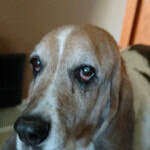 Who could stay mad at a Basset hound? It is impossible. 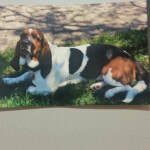 Thank you to Basset Buddies rescue for allowing me to adopt Flash. His unconditional love has seen me through some of the hardest times my life.